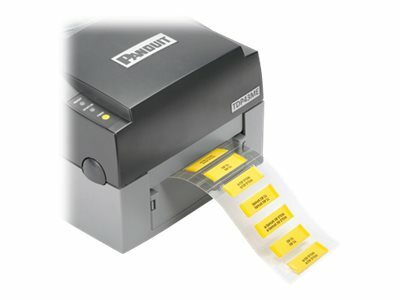 Panduit 2-sided military grade heat shrink labels are designed to meet the wire and cable labeling needs of organizations with high performance requirements. These labels allow legends and text to be printed and read from two sides and feature an innovative liner perforation and open-end design to streamline printing and label installation. Durable material construction and high performance thermal transfer print technology combine to deliver printing performance and reliability for use in harsh environments.